Welcome to all who come to this special space to reconnect with God. A very particular greeting to those new or returning to our campus and community. We invite you to consider yourself one of us and count the University Church as your church home. We are a diverse worshipping community that includes many ages, backgrounds, home towns, cultures, professions, interests, and passions, but we are united in our devotion to God, our determination to put Jesus at the center of our lives, and our commitment to carry the inspiration of this service into the days ahead. We worship to celebrate what God has done for us already, to prepare ourselves to brighten the lives of others in this world, and to prepare them and us for the world to come. Today our welcoming table is very large. 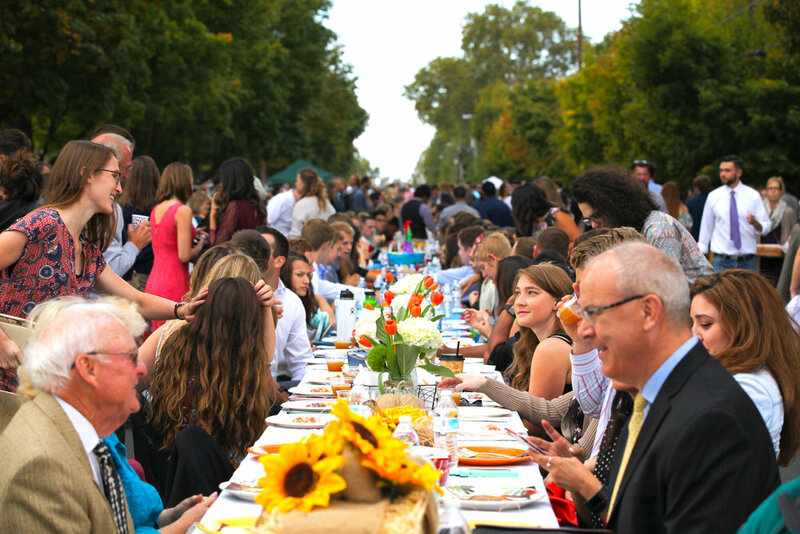 We call it “The Longest Table.” For ten years it’s been our way of opening our arms to one another at the beginning of a new school year. 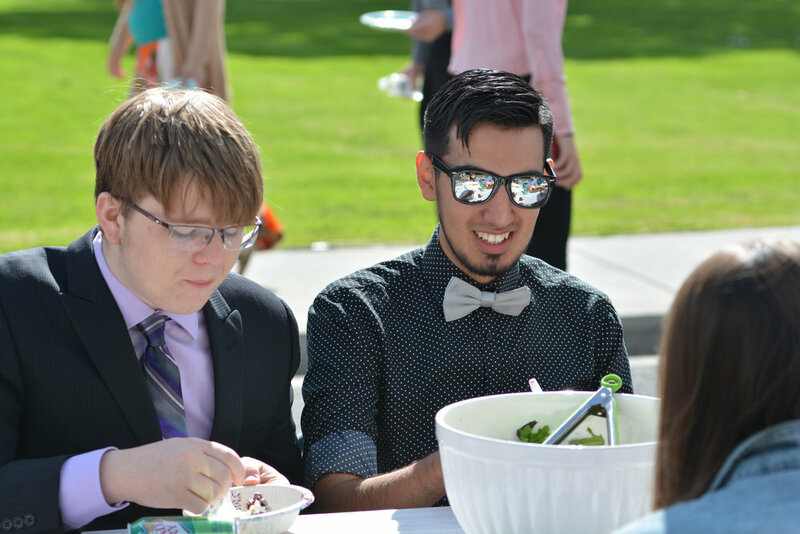 Members invite students to join them, to sit at a table and get acquainted with that table’s hosts. Students accept hospitality, feel genuinely welcomed, and spark friendships for months and even years to come. Welcome! Let us come together to worship, celebrate, and serve our good God! Today following Second Service, students and guests are invited to join the University Church family on 4th Street for lunch. Hundreds of church members have chosen to sponsor tables and to prepare meals in hopes of creating community and fellowship with you! Please be our guest! Join us outside once the service concludes, choose a spot along the more than 150 tables set up running down 4th Street, and get to know your hosts! Please remember that the table stretches all the way from College Avenue to Davis Street near the gym. While you might be tempted to choose the first table you see, you might consider a stroll to one end of the street or the other first. Water bottles are provided by the University Church. Prayer over the meal will take place at about 1:30pm. All are welcome to contribute to tear-down at about 4pm. We wish a warm welcome back to all students—it is good to have you home. We also welcome the wonderful musicians of University Singers and choral accompanist Siena Mirasol, and cellist Brandon Rittenour. Siena is a junior from Portland, and Brandon is a sophomore from Spokane. Please join me in thanking them all for leading our worship through music. The organ postlude directly repeats a short melodic idea for a very specific reason. The word “litanies” refers to a special type of prayer that repeats a refrain or petition over and over, Psalm 136 provides a good example. The composer Jehan Alain (1911–1940), who died in the French resistance of World War II, appended the following words to this piece. When the Christian soul in its distress cannot find words to implore God’s mercy, it repeats ceaselessly and with a vehement faith the same invocation. Reason has reached its limit. Faith alone can go further. May we each, in the stunningly powerful sounds of this repetitive piece, perceive the strength and power of our wonderful Lord who promises to be with us even in the shadows and valleys of our life. And this year may we determine to repeat the promises of God as often as necessary to sustain us. This year, 1,825 students are enrolled at Walla Walla University and attending classes on one of the university’s five campuses. Their college years are a time of transition—from adolescence to adulthood, from reliance on parents to a place of more autonomy. During that process, Walla Walla University seeks to provide an environment and services that support the whole development of each student. In addition to world-class higher education, those resources include career counseling and internship placement services, opportunities to study abroad, organized social activities, community service opportunities, and programs that nurture spiritual development—just to name a few! This Sabbath, Adventist churches across the North Pacific Union Conference will take up a special offering for Walla Walla University. Loose offering received today will go toward this cause. Thank you for your financial support and prayers for Walla Walla University throughout this year as we look together toward the blessed hope. WWU Week of Worship begins on Monday, October 1, at 11:40am in the Sanctuary. Laurence Turner, Principal Lecturer in Old Testament at Newbold College in the United Kingdom, will speak. All are welcome to attend! Looking for a good old fashioned Sabbath School? Why not try “Renew,” a small close-knit group of students who meet in the Havstad Alumni Center every Saturday morning starting at 10am. We have food, sing hymns around the piano and then break off for discussion groups led by students and professors alike. We are wanting to extend a warm welcome to community members and would love to see your smiling faces join us. The flower committee invites University Church members to contribute Sabbath morning bouquets for the Sanctuary platform. Sign up or get more information by visiting the information desk in the church lobby or by emailing church@wallawalla.edu. Thank you! To our church family for your expressions of sympathy during the recent loss of Jerry’s mother, Ermadean Walker. It was much appreciated. A Celebration of Life service for KarrLayn Beck will be held on October 6 at 4pm in the University Church Sanctuary. Church members who would like to help support the Beck family may sign up to provide a meal for them at takethemameal.com. Search "Beck Family" with the password "0312" to find information and dates that meals have been requested. Contact Lori Ann Wilkinson with questions: 509.540.0586. A Celebration of Life service for Charles Edwards will occur on November 3, at 3:15pm in the University Church Sanctuary. A memorial service for Lawrence Claridge will be held on October 7 at 11am in the Village Church. In lieu of flowers, contributions may be made to SonBridge ministries. A memorial service for Bob Forsyth will be held on October 7 at 2pm in the Kennewick SDA Church. 7105 W. 10th Avenue, Kennewick, WA. Looking for a good old fashioned Sabbath School? Why not try Renew, a small close-knit group of students who meet in the Havstad Alumni Center every Saturday morning starting at 10am. We have food, sing hymns around the piano and then break off for discussion groups led by students and professors alike. We are wanting to extend a warm welcome to community members and would love to see your smiling faces. Join us! Start your day with worship in Heubach Chapel Monday through Friday mornings from 7:30–7:50am. Music, fellowship, prayer, singing, worship credit, and a blessing! The Denominational Retired Workers’ first potluck and program for fall 2018 will be Sunday, November 4. There will be no potluck on Sunday, October 7. The College Place Spanish Church is having an “Enchiladas To Go” fundraiser for Christian Education. To place an order, call 509.525.9523 or 509.301.2956 or email enchiladasforeducation@gmail.com before October 9. Thank you supporting Christian Education! The Women's Ministry committee of the Village Church in College Place is planning a brunch and program to be on October 14, at 10 a.m. in the Village Church Fellowship Hall. The women of the University Church are invited to join them. Please RSVP to the Village Church office, 525-0882.